In 1987, a time of rampant discrimination and stigma during the early years of the HIV/AIDS epidemic, people living with HIV faced unique legal problems: workplace discrimination, insurance denials, confidentiality breaches, and illegal evictions. School children were kicked out of their classes. Renters suspected of having HIV were kicked out of their apartments. Others were left to die in hospital hallways. People with AIDS were falling through the holes in our nation’s “safety net” of public benefits; the syndrome was so new and misunderstood – especially in women – that government agencies weren’t properly evaluating disability claims. Despite a significant and irrefutable lack of legal services available to people with HIV, one young Chicago attorney took a more level-headed approach: James Monroe Smith recognized these unique legal problems, and assembled a group of volunteers committed to making a difference in the lives of people with HIV. 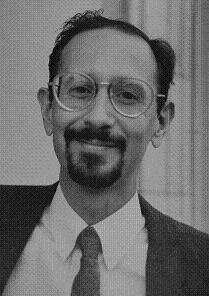 In the living room of Jim's North Side apartment, Jim brought together experts in law, health care, and social services and founded AIDS Legal Council of Chicago. 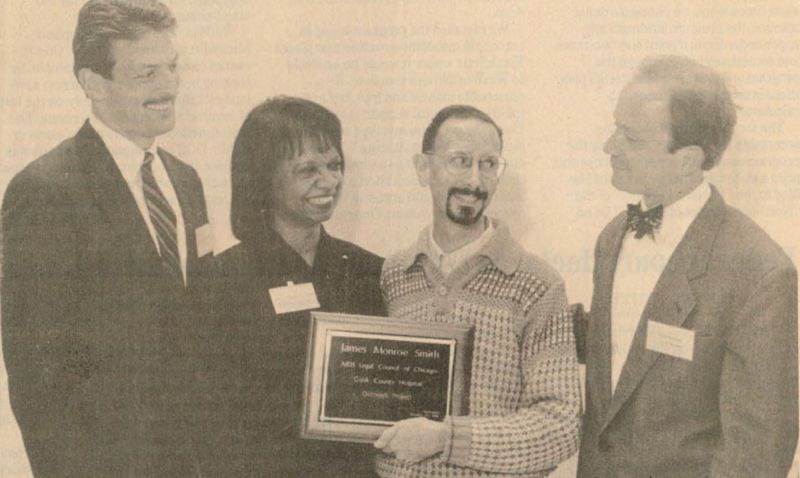 When ALCC first opened its doors with a staff of only two – Jim and his secretary – the agency was among the very first organizations in the country devoted exclusively to protecting the legal rights of people with HIV––a mission it would pursue through free legal counsel, education, and public policy advocacy. 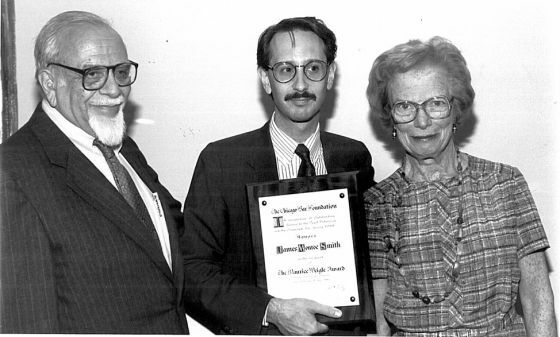 Founder James Monroe Smith (center) with Maurice Weigle, Jr. and his wife Helen Weigle, presenting Smith with the Weigle Award in 1989 at the Chicago Bar Association annual luncheon. After only a few months after opening day in Jim's living room, ALCC moved into its first real office in the South Loop, thanks to many generous donors. Soon Jim began expanding the small team of experts and hired two new full-time employees: a legal director and a case manager. This bare-bones staff organized a team of volunteer attorneys from across Chicago and took on the kinds of cases that would set important legal precedents for the rights of people with HIV in Illinois. Due to a growing demand, ALCC continued to develop new programs, keeping pace with the AIDS epidemic and reaching those in greatest need. 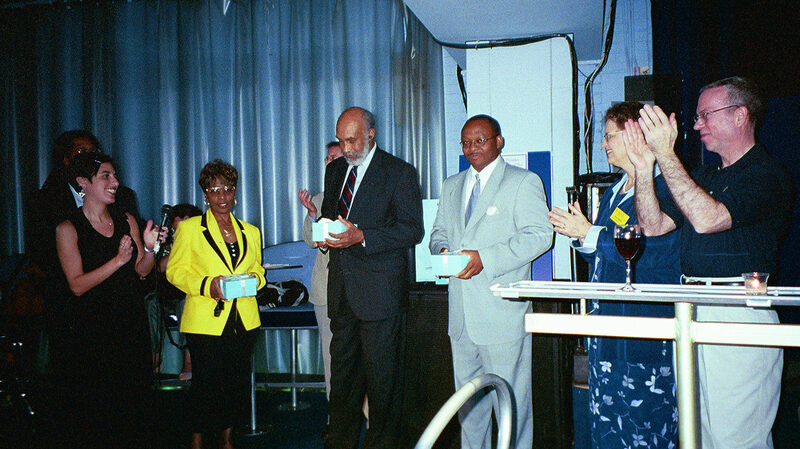 In 1991, ALCC opened the James Monroe Smith Outreach Office on the campus of Cook County Hospital, allowing for more uninsured individuals to receive legal care. Many of these clients were African-American and impoverished, living in the south and west sides of the city. Four years later, with HIV beginning to impact a greater number of Latinos, the agency hired its first bilingual attorney and began working more closely with Latino-centered organizations, marking the beginning of ALCC's Latino Outreach Project. Currently half of Legal Council’s staff members are Spanish-speaking. When new advances in HIV treatment gave many people with HIV new leases on life, ALCC initiated its Return-To-Work Project in 1997, counseling individuals wishing to rejoin the workforce on their confidentiality issues, job accommodations, their rights as employees, and the affect new employment could have on their Social Security, Medicaid, and Medicare benefits. The same year, the agency initiated its Family Options Program to counsel HIV-positive parents on guardianships and other long-term planning for their minor children. 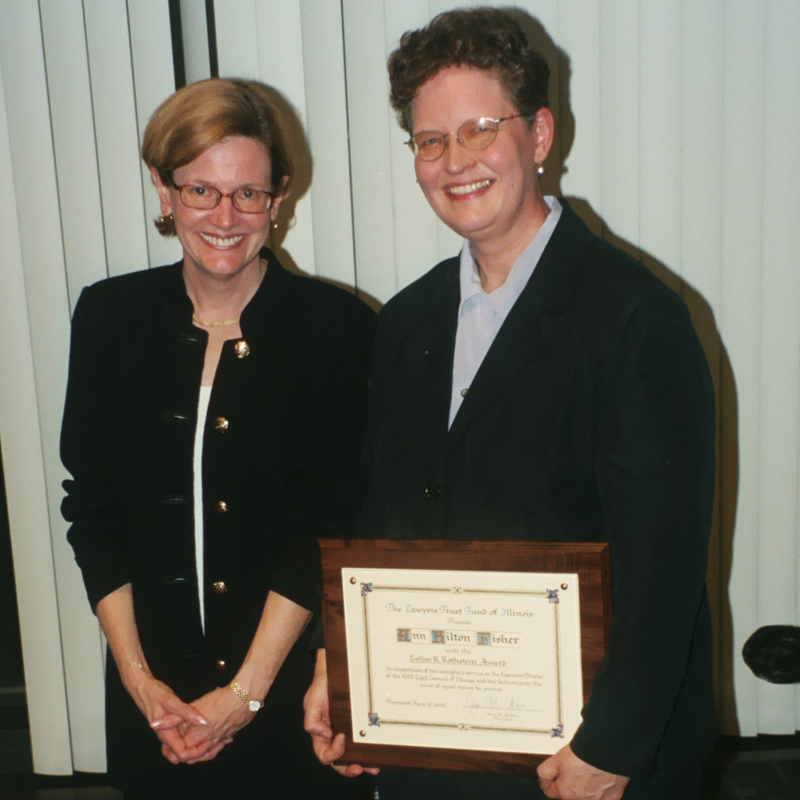 Ann Hilton Fisher (right), Executive Director with the agency for 17 years, is awarded with the Esther R. Rothstein Award by the Lawyers Trust Fund of Illinois on June 13, 2002. This honor is awarded in recognition of exemplary service and dedication to the cause of equal access to justice. ALCC honored Jim Smith by renaming its Cook County Hospital Outreach Project the James Monroe Smith Cook County Hospital Outreach Project. From left to right: John R. Myers of Bell, Boyd & Lloyd (board member), Doris Mitchell Green of Buehler Center on Aging (board member), Jim smith, and Paul K. Vickrey of Niro, Scavone, Haller & Niro (board member). Taken October 1996. In July 2000, ALCC hosts its annual benefit, the Advocates of the Year Awards, honoring outstanding individuals working to make a difference in the lives of persons with HIV/AIDS. The honorees for 2000 included Hon. Danny K. Davis, Hon. Jesse L. Jackson, Jr., Hon. Bobby L. Rush, Senator Christine Radogno, and The Hearts Foundation. New programs continued to arise: in 2002, ALCC founded its HIV-Positive Immigrants' Rights Project, providing legal assistance to foreign-born individuals living with HIV. Recognizing that immigrants with HIV not only face unique barriers to legalizing their citizenship status, but also often face singular difficulties in accessing justice, health care, and stability, ALCC's staff underwent extensive training in the area of immigration law, making us the first legal organization in the Midwest that offered HIV-specific legal assistance to foreign-born individuals with HIV. Today, we are accredited by the Board of Immigration Appeals to represent its clients before the Department of Homeland Security. Since beginning the Immigrants’ Rights Project, Legal Council has served clients from more than 80 countries. As ALCC’s HIV-centered partnerships with community care and service providers garnered exceptional success, the organization slowly began to expand its reach and scope: In 2014, the agency added two longstanding free legal service programs, expanding our mission to serve two more populations: persons who are homeless and disabled, and children with disabilities and chronic health conditions and their families. A year later, ALCC changed its name to Legal Council for Health Justice in 2015. Throughout the agency’s existence, thousands of residents in every neighborhood in Chicago, every community in Cook County, and throughout Illinois have received free and life-saving legal services. Legal Council has helped draft significant legislation, testified before various legislative bodies, and trained thousands of providers across the state. Today, we serve thousands of low-income people facing chronic and stigmatized health conditions each year. 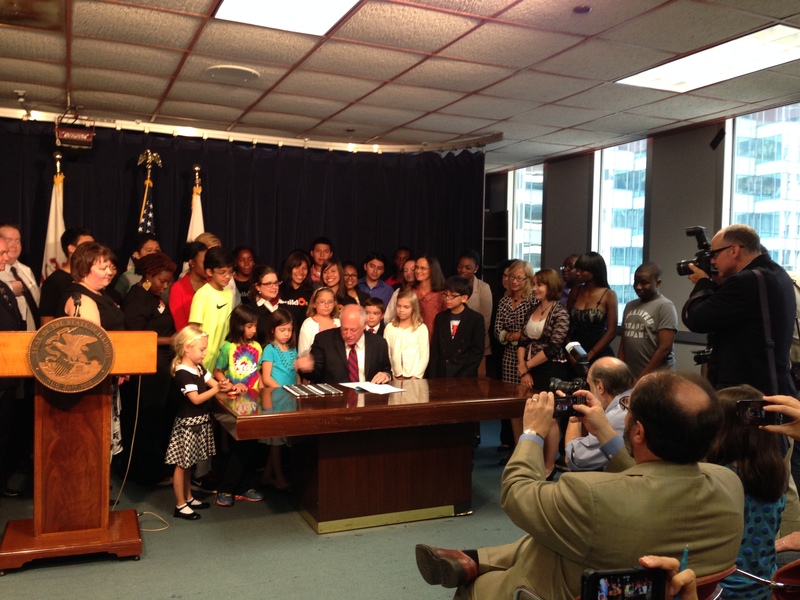 On July 30, 2014, Illinois Governor Pat Quinn signs HB5892 into law as Illinois Attorney General Lisa Madigan and the agency's new children & families program director Amy Zimmerman look on. Legal Council staff members attend the National Center for Medical-Legal Partnerships Conference in April 2017. Legal Council has come far since Jim Smith’s living room in his North Side apartment, but we still have the same goal: to use the power of the law to secure dignity, opportunity, and well-being for those in our communities that are often forgotten. As we continue to grow as an agency, our free, legal programs will continue to expand in reach and scope but we will always remain dedicated to our approach to delivery of service: Our award-winning medical-legal partnership programs provide highly specialized “legal care” in partnership with health and community providers to protect individual rights and maximize access to health, education, and a responsible safety net.